JNN 04 Feb 2015 TRIPOLI — Unidentified gunmen on Saturday robbed the Jordanian embassy in the Libyan capital Tripoli and kidnapped a security guard, according to a security source. 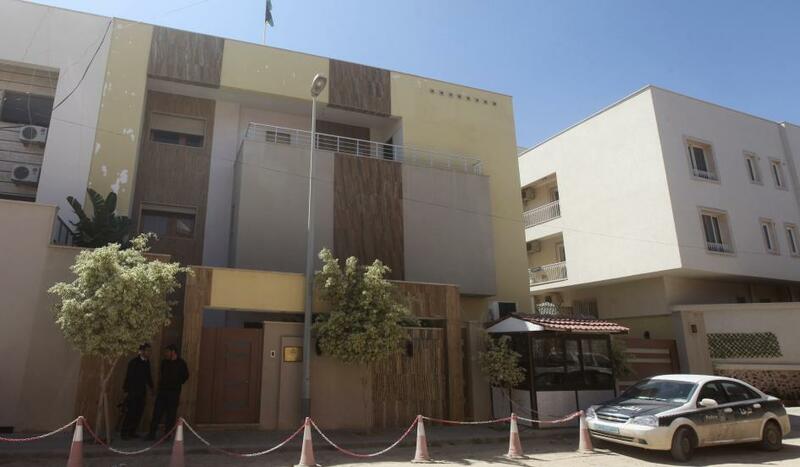 “Unidentified gunmen on Saturday afternoon armed robbed the Jordanian embassy located in the center of Tripoli.” Said Essam Al-Na’as, spokesman for the joint security operations chamber in Tripoli. The spokesman also said the gunmen who robbed the embassy kidnapped a security guard of the embassy and took away a diplomatic security vehicle. The entire Jordanian diplomatic mission in Tripoli left Libya after the ambassador Fawaz Al-Etan was kidnapped by militias in Tripoli in April 2014. He was freed after the release of a Libyan al-Qaida member who were in the custody of a Jordanian prison. This entry was posted in AFRICA, Middle East and tagged Africa, diplomatic security, Jordan Embassy, Jordanian embassy, security forces, security source, Tripoli, Unidentified gunmen. Bookmark the permalink.